www.rockproducts.com ROCK products • November 2018 • 59 COMMUNITY RELATIONS Thomas J. Roach, Ph.D., has 30 years experience in communication as a journalist, media coordinator, communication director and consultant. He has taught at Purdue University Calumet since 1987, and is the author of "An Interviewing Rhetoric." He can be reached at thomasjroach@gmail.com. Aristotle advised his rhetoric students to avoid making emo- tional arguments. If debate is about discovering truth, then it should be restricted to logical and ethical proofs. In the old days people built arguments by listing examples or providing evidence. Now it is okay to, as some NIMBY groups do, skip all that and start with something like, "I'm outraged …". You used to have to prove your opponent wrong, now you can just call him, her or it a name. Forget about studying how to write thesis statements and make syllogistic arguments, you learn everything you need to know during recess. Many journalists, scientists and responsible companies still try to follow Aristotle's advice. However, contemporary rhe- torical scholars contend that all communication is subjective, including news stories and scientific research papers. Choosing what to write about and selecting words and argu- ments are subjective actions regardless of our intentions. While this point is valid, as discerning listeners we still can assess the degree of objectivity in the discourse. Even if we cannot know for sure if a statement is correct, we might evaluate the effort the speaker makes to be logical and truthful. In other words, if something cannot be proved, then the effectiveness of the message may become dependent on the trustworthiness of the speaker. How Do We Show Good Intentions? One tactic is to make logical arguments and avoid making emotional arguments. We may not absolutely be able to prove what we say, but we can show that we are not trying to take advantage of our audience. Emotional arguments are becoming increasingly popular in politics, television, film and with community activists, but in the business world responsible decision makers still want facts or at least the best available version of the facts. Media entities and their reporters have reputations to main- tain. While their content is subjective at some level, we know that they are at least trying to be truthful. All businesses need to adopt this standard. 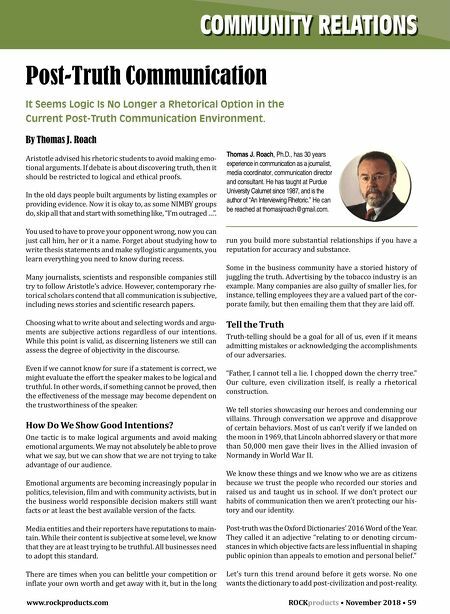 There are times when you can belittle your competition or inflate your own worth and get away with it, but in the long Post-Truth Communication It Seems Logic Is No Longer a Rhetorical Option in the Current Post-Truth Communication Environment. By Thomas J. Roach run you build more substantial relationships if you have a reputation for accuracy and substance. Some in the business community have a storied history of juggling the truth. Advertising by the tobacco industry is an example. Many companies are also guilty of smaller lies, for instance, telling employees they are a valued part of the cor- porate family, but then emailing them that they are laid off. Tell the Truth Truth-telling should be a goal for all of us, even if it means admitting mistakes or acknowledging the accomplishments of our adversaries. "Father, I cannot tell a lie. I chopped down the cherry tree." Our culture, even civilization itself, is really a rhetorical construction. We tell stories showcasing our heroes and condemning our villains. Through conversation we approve and disapprove of certain behaviors. Most of us can't verify if we landed on the moon in 1969, that Lincoln abhorred slavery or that more than 50,000 men gave their lives in the Allied invasion of Normandy in World War II. We know these things and we know who we are as citizens because we trust the people who recorded our stories and raised us and taught us in school. If we don't protect our habits of communication then we aren't protecting our his- tory and our identity. Post-truth was the Oxford Dictionaries' 2016 Word of the Year. They called it an adjective "relating to or denoting circum- stances in which objective facts are less influential in shaping public opinion than appeals to emotion and personal belief." Let's turn this trend around before it gets worse. No one wants the dictionary to add post-civilization and post-reality.